Site M-42 was in need of improved bank stability installing 50 meters of cedar rail fencing that will inhibit livestock access to the river, thus preventing further deterioration of the bank and sedimentation of downstream critical spawning areas and fish habitat. 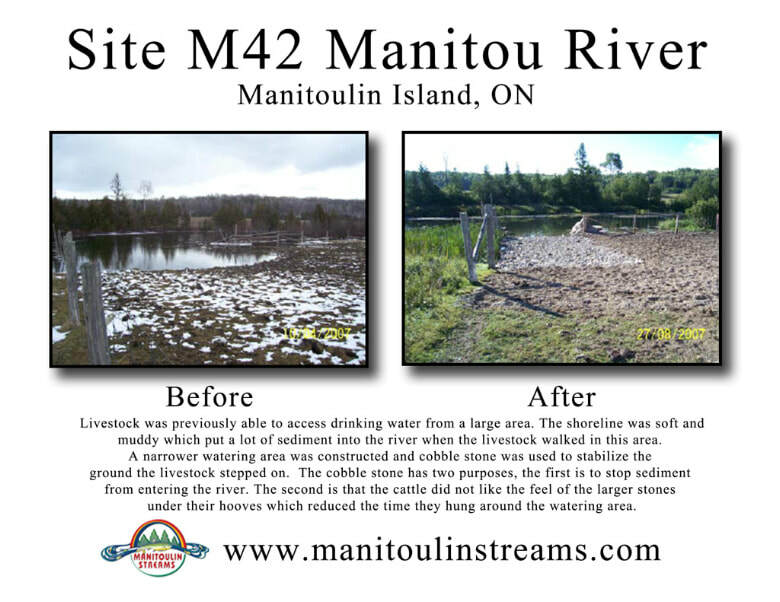 The rehabilitation of Manitou River Site M-42 involved the construction of a livestock watering pad along the bank of the Manitou River. The work involved the removal of the existing, poor quality material and the installation of a new livestock watering pad with a coarse fill topping. Fencing was extended to the edge of the new pad with assistance from the Ontario Stewardship Rangers, volunteers and the landowner to limit livestock access to only the new pad. Large boulders were placed in water to contain both the livestock and the coarse fill used to create the new pad. Poor material surrounding the new pad was removed and replaced with coarse granular fill to help prevent disturbed soil particles from entering the river. The boulders and gravel provide good habitat or cover for juvenile and adult fish and invertebrates since it reaches a 0-3ft depth. Furthermore, the shoreline was stabilized and re-vegetated by the landowner along the inside edge of the fence. Trees will provide shade and cover for fish and wildlife and act as the beginning of the food chain for invertebrates and juvenile fish. The work was completed according to the site plans through the cooperation of the landowner, volunteers, Ontario Stewardship Rangers, consulting expertise of Great Lakes Environmental Services (GLES) and equipment, material, and services of Lloyd & Sons Trucking Ltd. Funds from various sources were used to complete this project; from DFO was for Site Design, CFWIP, and co-Action for rental of heavy equipment and operator and purchase of materials to complete rehabilitation work. COA for Site Supervision by a certified engineer. This project had 19 volunteers from Manitoulin Streams working on this project at various times. Manitoulin Streams had numerous meetings and email communications to discuss the details about this project including sending out Site Design Request for Proposals (RFP), Tender (RFP) and Site Supervision (RFP) to ensure proper delivery of site design and issuing a winner of the bids. A total of 20 hours of volunteered hours was dedicated by “Manitoulin Streams” committee members attending meetings to discuss planning procedures. CFWIP were used to purchase Armtec 200 non-woven geotextile, 1m diameter boulders and the page wire fencing. CFWIP funds also were used to pay for installation of 600mm thick, 50-100mm nominal size limestone rocks. Eleven Stewardship Rangers volunteered their time to aid the landowner to install the fencing to the watering ramp. It took 16 hours to complete it, therefore 12 people x 16hrs=192 hrs. This site had high erosion of the shoreline bank and sedimentation occurring as well as high nutrient loads due to the impact of livestock having access to the river. Erosion of the stream bank had caused sediment to be displaced down stream over critical fish habitat. Both pictures demonstrate the lack of vegetation along the shoreline which is needed to stabilize the banks.